Guardians Of The Galaxy #1 being relaunched by Brian Michael Bendis and Valerio Schiti with a new #1. 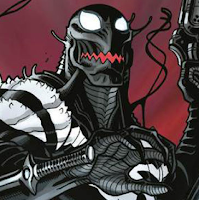 The team includes Venom, Thing, Drax, Rocket – and a female Star Lord? It seems so. Things really have changed in eight months. But no sign of Gamora or Angela… And the tagline reads “The racoon’s in charge”, so no one get any ideas above their station, apparently. With Marvel announcing a Venom ongoing, Carange series, and Venom still on GOTG... Next week's SDCC is going to be great!